SIMON FRANGLEN: "THERE’S NOT A DAY THAT I DON’T THINK OF JAMES." SIMON FRANGLEN: "THERE’S NOT A DAY THAT I DON’T THINK OF JAMES." 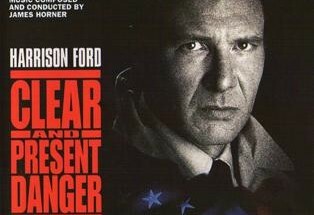 I still remember very well my first and only encounter with Simon Franglen. It was just before the Titanic Live concert in London. Throughout the afternoon during rehearsals I had seen him working alongside James Horner. The depth of their collaboration was evident. On many occasions, he had climbed the railings of the concert hall to access the back of the orchestra to ensure that everything was done properly with the synthesizers. A small detail that shows the perfectionism and professionalism of a musician. Minutes before the concert, while we each waited for friends in front of the Royal Albert hall, I had told him how much I appreciated his job on scores like Avatar, The Amazing Spider-Man and also the voice of his son Luca that we can hear in these two scores. When I started to introduce myself, he immediately stopped me and said he knew who I was and he knew the site. A small phrase that filled me with joy. 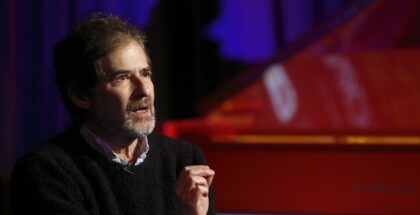 The day after the disappearance of James Horner, Simon wrote to me to tell me spontaneously "I know that James appreciated all the effort and care you put into the website." Little words that motivate to continue even in the darkest hours. 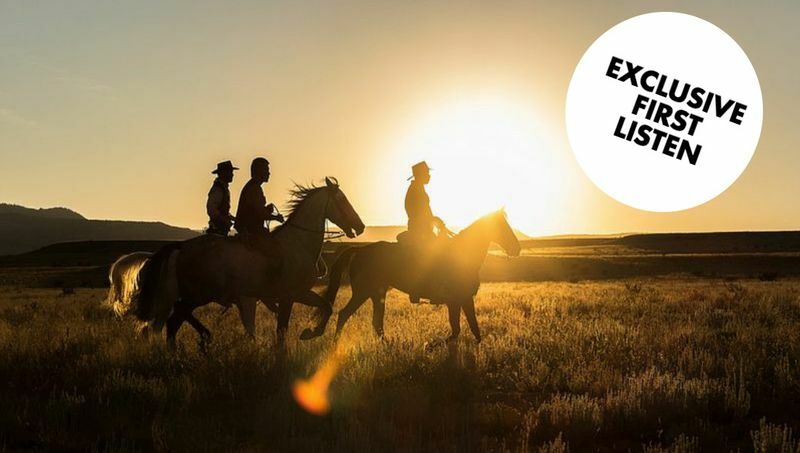 Following the recording of The Magnificent Seven, our discussions have made themselves more regular. I told him of my desire to be able to offer to the site's readers an exclusive look at this music. So he took the time to negotiate with MGM and Sony for me to get an advanced copy. He even participated in the finalization of the article! Little attention that proves the man's generosity. 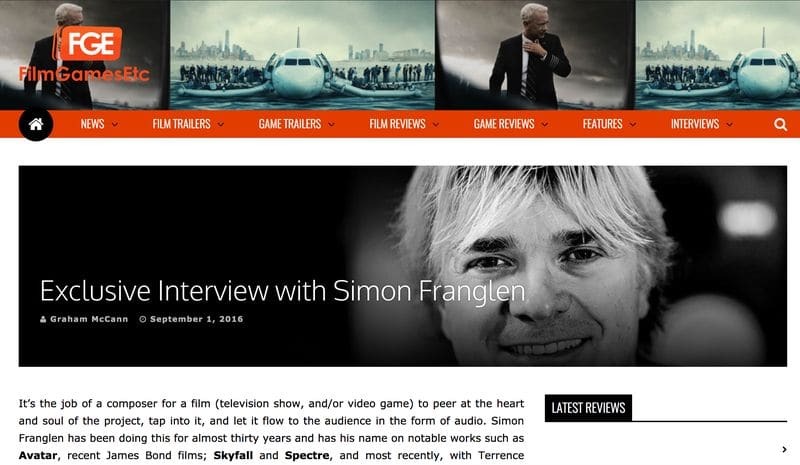 Last week, despite his busy schedule at the Toronto Film Festival where he participated in at least six interviews (see links at bottom of page), Simon took the time to answer our questions to celebrate today the release of the album. 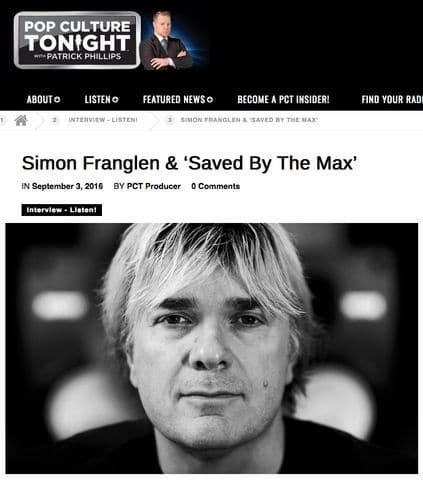 One last element that is added to all the others to demonstrate how great a person is Simon Franglen. How has the passage of time been for you since June 2015? Obviously there has been a lot of work involved since then, scoring The Magnificent Seven and on the many other projects that I am involved in, but there’s not a day that I don’t think of James. He was very much part of the fabric of my daily life, the phone would ring several times a day during projects, sometimes my son might answer and chat to James because he was part of my extended family. I miss him immensely. You tell the story of this music in the notes of the album. But can you tell it again for those who do not yet have the chance to have the album? 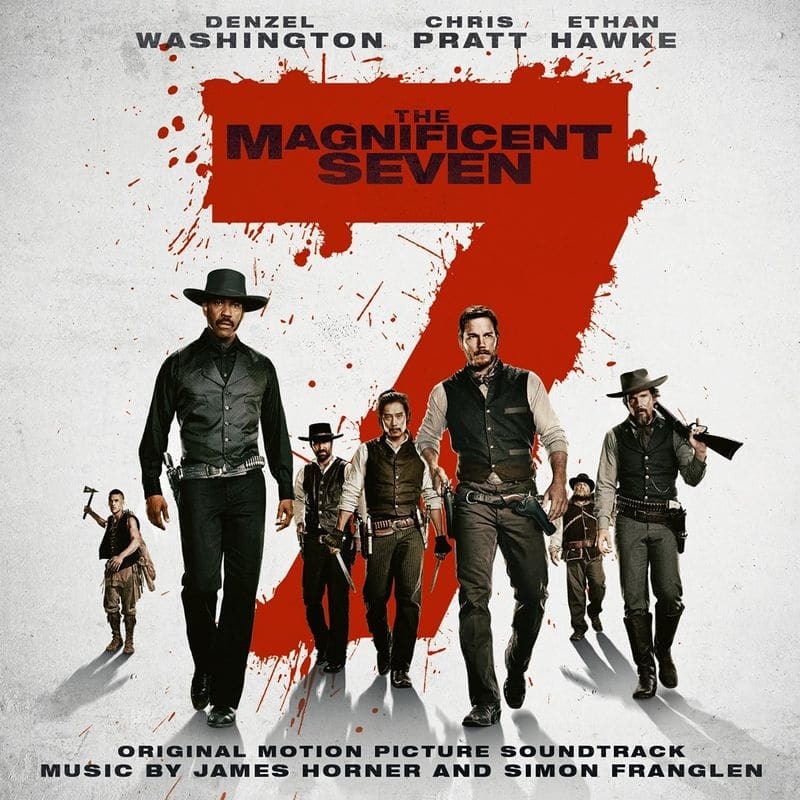 In the Spring of 2015, as we finished the score to Southpaw, director Antoine Fuqua and James were engaged in discussions about The Magnificent Seven, which was to be their next collaboration. 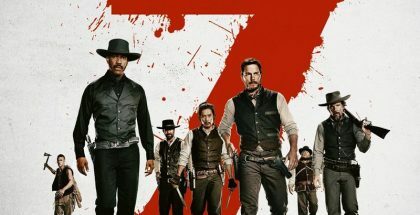 In approaching “Mag 7”, James knew he’d have to write a score that related to Elmer Bernstein’s much-loved theme for the 1960 original, but he also knew that the film scoring language of that older film was not going to work in this modern retelling of Akira Kurosawa’s masterpiece Seven Samurai. The challenges energized James, we met in London and he excitedly started working on themes while Antoine was beginning to film with his remarkable cast in Louisiana. A week later tragedy struck. James died in a private plane accident. We were devastated. In the aftermath, I couldn’t stop thinking about the powerful themes that were James’ final compositions. It seemed inconceivable that this music would never be heard. I was not alone with those thoughts. 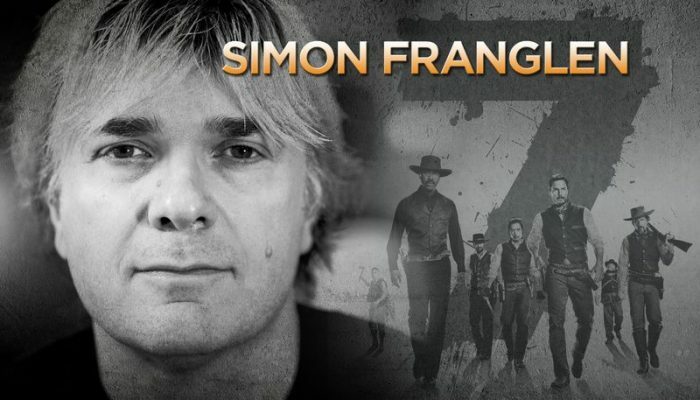 James’ trusted group of collaborators (including music editors Jim Henrikson and Joe E Rand, and orchestrator J.A.C Redford) were unanimous in encouraging Simon Rhodes and me to finish prepping the London themes so they could at least be presented to Antoine. 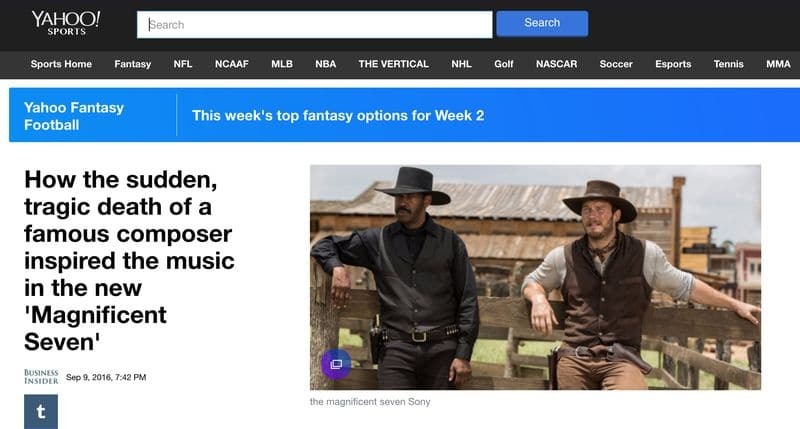 A couple weeks later I was on the set of The Magnificent Seven playing the music to the astonished director, who was overwhelmed by this unexpected gift from his departed friend, a gift that so perfectly ‘got’ the essence of the movie that Antoine was making, without having ever seen a frame of it. From there, it was a nine-month process of finishing the film and the score, with all the filmmakers and musicians coming from a place of love and respect for James’ music. I hope you can hear the outpouring of goodwill that everyone involved has shown, from the passion that the orchestra put into every note, to the support that Antoine, Roger Birnbaum and MGM have shown throughout the process. 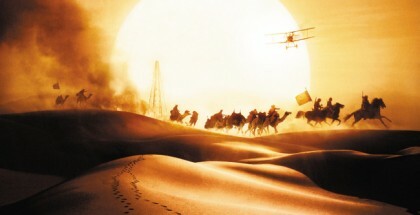 I believe that the music as it has been completed reflects James Horner’s spirit. As you listen, remember James, and as he would have always insisted, hear the soul of the film in the score. Can you tell us about the original pieces by James Horner and how they evolved into the final score? James wrote themes based on the script. Simon Rhodes and I spent time with James during that week discussing how to arrange and score the film. From these themes, we arranged a suite of orchestral music to give Antoine. We recorded this suite with an orchestra as we wanted to James’ themes to be presented as they might have sounded in the film. Obviously the score evolves from James’ themes like an acorn grows into an oak tree. There will be things that happen as it grows to affect it, but it will always end up an oak. Did other members of Team Horner attend the recording sessions for The Magnificent Seven? Who conducted the orchestra? Who were some of the performers? The entire musical family was involved from start to finish. 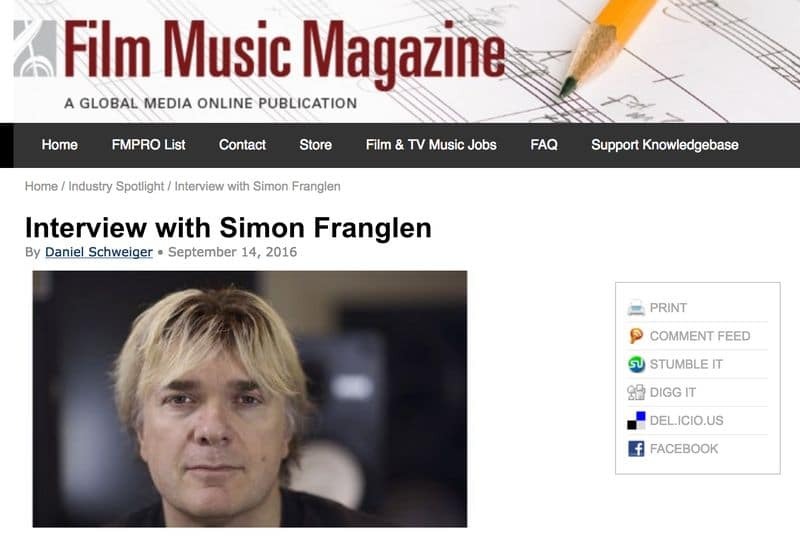 I must highlight Simon Rhodes’ spectacular work, writing and arranging, as well as recording and mixing. J.A.C Redford and Steven Baker provided the score orchestrations, with J.A.C and Carl Johnson conducting the orchestra. You’ll hear a lot of George Doering; he brought his wonderful guitar and exotic stringed instrument work throughout. Tony Hinnigan worked before we started scoring and you can hear him within the score. Before we started I asked everyone for a minute of silence to remember our friend. Many in the orchestra had known him for twenty to thirty years. 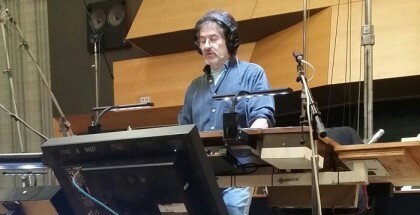 There was an atmosphere of a deep love for James and everything he had brought to film scoring. The musicians put their heart and soul in the score and I think you can hear that. What was your feeling when the orchestra began to play the first notes of the music? Reflection in the past years, a wish to make sure that we would make James proud of the fact that we had actually got to this point, followed by the intensity of a scoring session which doesn’t allow you to do anything but focus on the music as it goes down. Where did you get the idea to use the banjo for the theme of evil (Devil in Church)? I have a collection of different instruments in my studio. I needed to find a texture that had an unsophisticated edge to provide the tension and rub with the violin line. I had been trying different things for a few days, clay pots, metallic percussion but then I picked up the banjo; it was obvious it had the right character as part of Bogue’s theme. I created a rhythm that is slightly off balance, that combined with echoes and effects layered many times gave the banjo its dysfunctional sound. How does it feel to have successfully completed this particular project? I think that all of us, Simon, Joe E., J.A.C, Jim, Steven and I are proud of where this has ended up. It’s a film score that reflects the film. I hope James is looking down and approving. Could you tell us more about your projects as a composer? I recently completed writing music for Terrence Malick’s Voyage of Time, which was a joy. A very different process but wonderful to be involved. I finish a massive immersive 3 dimensional composition involving four orchestras, bells and choir for the Shanghai Tower’s 126th floor – 2000ft in the air. There are several more upcoming projects in 2017, some of which I think people will be amazed by. It will be a busy year. 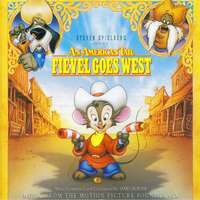 What do you remember from your first collaboration with James Horner 25 years ago for the wonderful song Dreams to Dream (An American Tail: Fievel Goes West)? That single took a long time to complete, there were many different version as it was refined. Although it was not a hit, we can thank this song for Céline singing My Heart Will Go On. 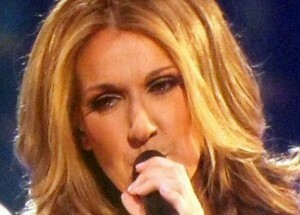 At the time, Céline was far less well known than now; she was asked to try a vocal on the song, everyone loved it. 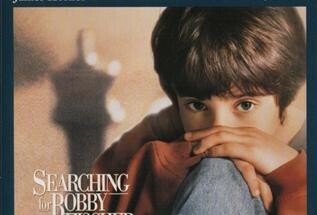 For many reasons it was decided ultimately that Linda Ronstadt should sing the final version; she obviously had a huge hit with Somewhere Out There and continuing that relationship with the film was thought to be the right thing to do. James could never forget Céline’s voice. When he gave me the piano sketch of My Heart Will Go On, he asked me if I could create a production that would be right for Céline, with whom I had worked many times. He never forgot her performance on Dreams to Dream. Six years after Dreams to Dream, you re-teamed with James Horner for My Heart Will Go On. How does it feel to have worked on one of the best-selling singles of all time? I’m very proud of My Heart Will Go On. 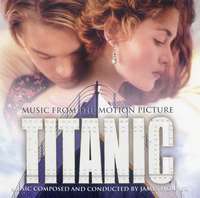 It is a song that provides so much emotional resonance for the film that has gone before it, the music themes obviously, Jack and Rose obviously, but also the Young Rose against Old Rose, the loss of the fifteen hundred lives, the death of this majestic ship; I think My Heart Will Go On brings all of these elements together to close the film and allow you to think about what has gone before. James and Will Jennings made something timeless in the song. I hope my work, the production of the song, helped. 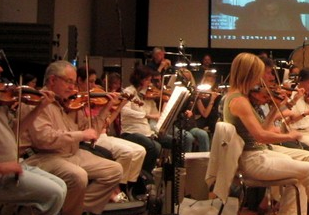 For Titanic Live, did you have to track down the samples used at the original scoring sessions? Ian Underwood and I are like elephants, we never forget. I had all the original parts in the Synclavier, which I switched on… and there they were. J.A.C Redford and I got the master mixes from the film and were able to reconstruct the score from the edits for the final version you heard at the Albert Hall. It was a difficult process which took several months but I hope people were pleased with the result. 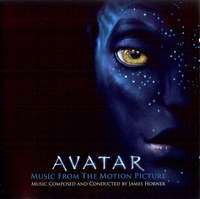 The Titanic and Avatar scores were several months in the making. They must have been two huge challenges? 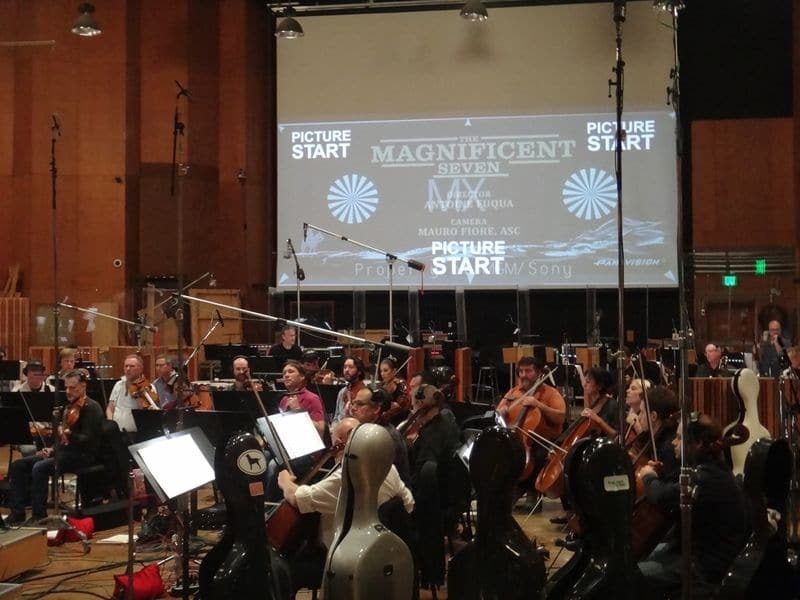 [On Titanic] Ian Underwood and I created all the synthetic elements that you hear in the score over several months at Castle Oaks studios in Calabasas. I also engineering the synthetic elements for the film, before we moved onto the orchestral part of the scoring. Avatar was at another scale. On Titanic I’d had to persuade manufacturers to lend us equipment so I could record the synths in the score properly (there was almost no money for the film score, which is one of the reasons for the large amounts of synth cues on Titanic), on Avatar there was already the expectation that this needed to be done right and given the complexity of what Jim Cameron was trying to accomplish, the score would need to reflect that. With Cameron, he always challenges you to find new ways, every day was a new adventure. After Avatar, you worked with James Horner on almost each of his new projects (The Karate Kid, Black Gold, The Amazing Spider-Man, Wolf Totem, Southpaw, The 33). Are we right in thinking that you were gradually filling the shoes of the legendary Ian Underwood, with whom James Horner had worked since Wolfen (1981)? I could never fill Ian’s shoes. Ian is one of the true greats of film music as far as I am concerned. 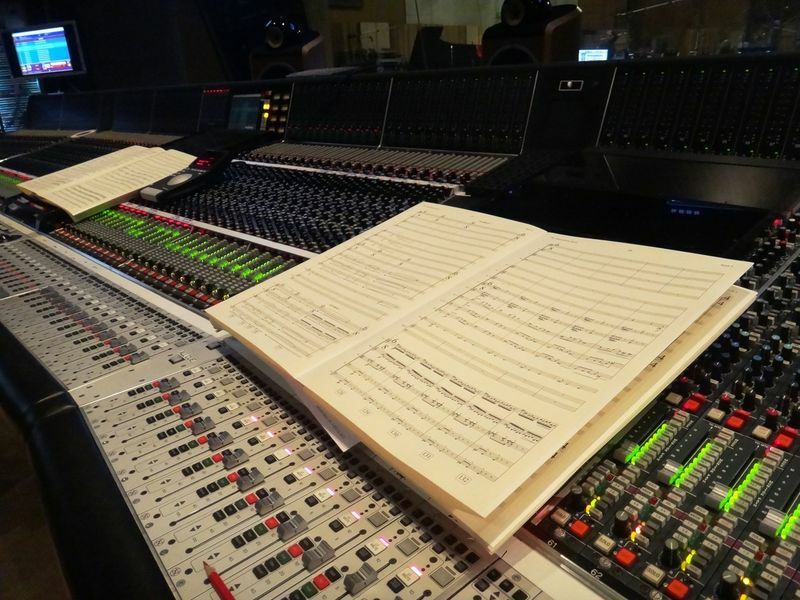 I provided a different role, which gradually evolved from arranging to producing the scores. My synth work is just part of what I do naturally as a musician. 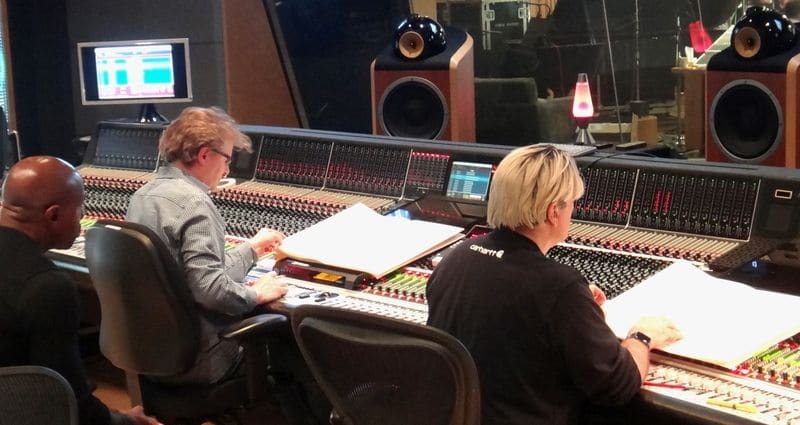 For Living in the Age of Airplanes, we saw you on a photo during a recording session with composer and arranger Steve Sidwell. What role did you play in that score? 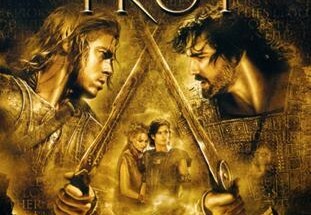 I was the score producer for the film and arranged the score with Simon Rhodes. I brought Steve in for a sequence that needed a Big Band Latin arrangement, he’s ridiculously great. The Southpaw score has amazing electronic colors. How were they designed? 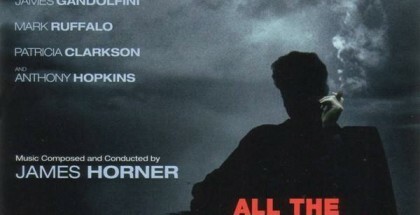 What were James Horner’s guidelines? I urged James to do Southpaw. I wanted James to look at new ways of making music, to get him out of his comfort zone. Southpaw had a very limited music budget which meant no orchestra and that gave ample opportunity to move into new ways of working. The sound of feel of a score is always defined by the emotions within the film. Antoine wanted an urban gritty edge, something I understood well from my record work and so Simon Rhodes and I created all of these textures within our programming setups to bring those elements to the score. Photos courtesy of Simon Franglen. Mr. Franglen, thank you for your availability, your generosity, and kindness. 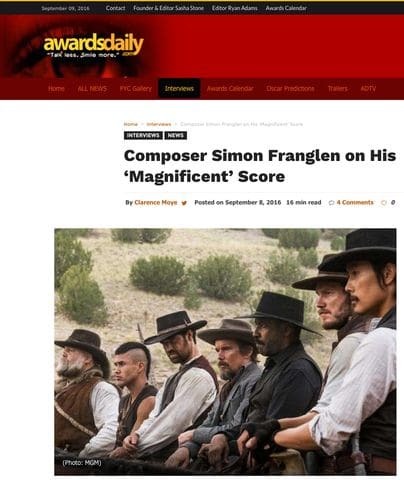 Thank you JB, for doing this wonderful interview of simon and thank you so much simon for giving us insight about all the things regarding scoring of Magnificent 7 and your collaboration with james. We listen to james music again for one last time which we will cherish forever. we will never forget james and he will always live in our hearts through his wonderful music. What a precious title-one we can all agree with as James is there every day with us. Thank you Simon for your words today. Hope I get to meet you one day…the one special thing I didn’t get the chance to do was to meet James and say what his music means to us. Pamela.